Back in 1953 the Rolex company produced the Rolex Submariner, its first watch model able to operate deep underwater. The first Submariner model was an automatic one, was water resistant up to 100m, featured no protection for its bezel and its case had a diameter of 37 mm. Its reference number was 6204 and other subsequent models featuring small modifications were given reference numbers 6205 and 6536, as well as being called the “James Bond” models by collectors. Some of the most famous Rolex Submariner models can be examined on the watchclub.com website. In 1954 the Rolex company began producing three of its most famous Submariner models, i.e. those featuring reference numbers 6200, 6538 and 6538. These models are water resistant up to 200 metres and feature a bigger bezel than that of the previous model, as it was widened from a diameter of 5,3 mm to 8,0 millimetres. Furthermore, these new models are equipped with Oyster watch bracelets, available both in their extensible and in their fixed variants. The first modern Submariner model dated back to 1959. It had 5512 as its reference number and featured a protection for its winding mechanism. Water resistant up to a depth of 200 metres, this model featured a 7-millimetre winding mechanism and a 7-mm TwinLock (subsequent models had a Triplock) bezel. The Rolex Submariner model 5512 was produced for 20 years, until 1978. In 1962 the Rolex company put the SUBMARINER 5513 model on the market, where it remained for an amazing 28-year period. During these many years, this model underwent several modifications concerning its bezel, protections and quadrant. 1978 also saw the introduction of the first Submariner Date model. Featuring reference number 1680, this model was produced until 1979 and was made available both in its steel and its 18-karat gold variants (the latter featured reference number 1680/8). The golden variant was available in two version, one featuring a blue quadrant and bezel and another having these two elements in black. The steel models usually feature the “Submariner” word on their quadrant, in white. Some rarer, and significantly more expensive, variants exist, featuring the “Submariner” writing in red. Having discontinued its 1860 Submariner model, the Rolex company launched its Submariner Date model in 1979, featuring sapphire glass and 16800 as its reference number, made available in its golden variant (reference number 16808) as well. Both these variants feature the 3035 calibre, allowing rapid date change. 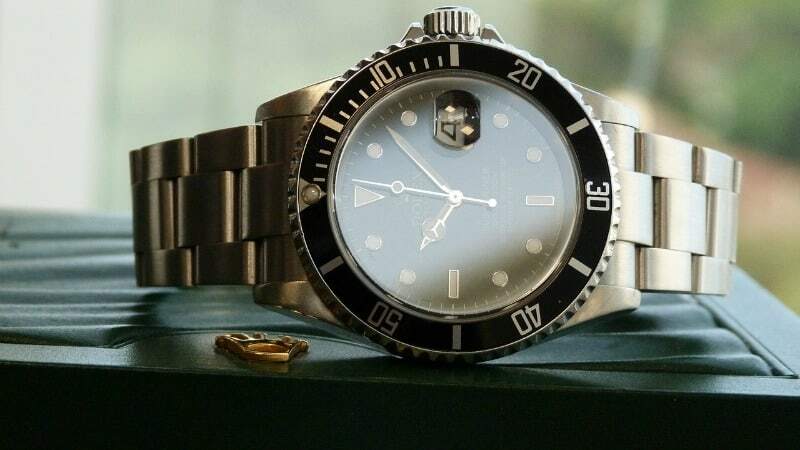 In the 1988 the Rolex company created the new 3135 and put the steel Submariner Date 16610 model, the steel and gold 16613 model, as well, as well as the 16618 gold model, on the market. The model featuring reference number 16610 is the best-selling of the three, and as time went by, it underwent significant evolution, featuring tritium quadrants, cases with holes and finishing on bracelets to superluminova quadrants, no-holes cases and SEL bracelets. In 1990, implementing its 3000 calibre, the Rolex company created its first no-date sapphire Submarine model, featuring reference number 14060. The reference number will then be shifted to 14060M following a change in the calibre used. The Rolex Submariner model celebrated its first 50 years, something calling for a new reference number: 16610LV. This Submariner 16610 model featured a green bezel and a “Maxi” quadrant (i.e., one featuring bigger elements), while its remaining elements and mechanical pieces remained unchanged compared with those present in other such models. The 116610 model, featuring a ceramic bezel, entered the market in 2007. The new “Green Bezel” model, featuring reference number 116610LV, entered the market in 2011 and gained “Hulk” as its nickname, having both a green quadrant and a green bezel.